WANTED: Talented actors & directors who might like to participate in Ron Tochterman’s new play “Innocence & Other Legal Fictions”. The production consists of two one act plays, and actors may consider participation in one or both plays. Interested directors may also indicate whether they would like to direct both plays, or just one. (An intermission will separate the two plays.) Performance dates are May 31, June 1, 2, 6, 7, 8, 9. Rehearsals begin May 1 with the exact schedule to be determined by the chosen director. Actors and directors will receive a stipend of $150 for one play, $250 for two plays. All other profits will go to the Leukemia & Lymphoma Society. “Innocence & Other Legal Fictions” will be Ron Tochterman’s second Sacramento production. 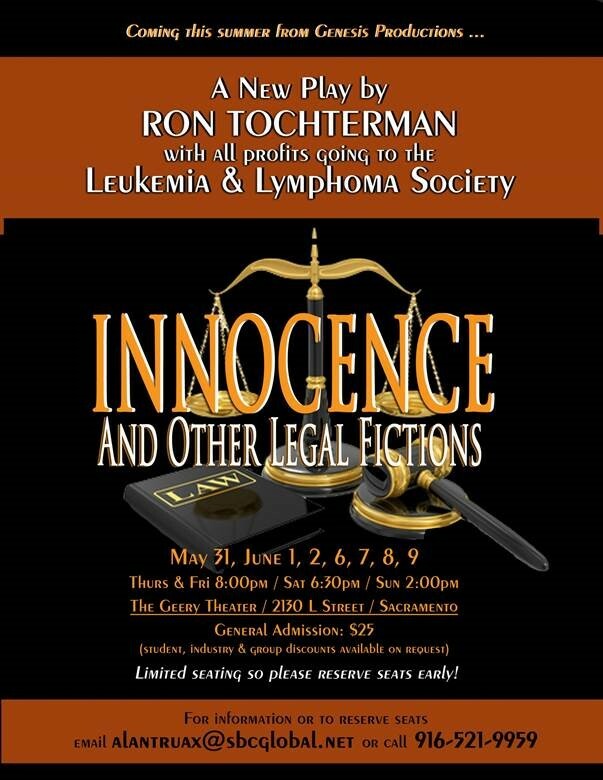 In 2018 Ron’s play “The Rules of Law” sold out every performance, including the dress rehearsal, and raised $6,000 for the Leukemia & Lymphoma Society. We anticipate each of our upcoming performances will sell out as well. SYNOPSIS: Jane, distraught, implores ex-boyfriend Leonard, a smug criminal defense attorney, to intervene on her behalf with more recent ex-boyfriend, Mario, who has been harassing her. After resisting, Leonard relents; he intervenes. Jane reciprocates by setting up Leonard for a fall at the instigation of Leonard’s nemesis, Donnie Ketchum, a police detective, who then conscripts Leonard in a scheme to bring down a corrupt judge, Janine. LEONARD LOMAN (40-70): The classiest sleazy criminal defense attorney in town. Speaks dumbed-down English. Narcissistic, boorish, eccentric. But charming. Hates cops and judges. DONNIE KETCHUM (40-70): A vindictive plainclothes police detective. Hates lawyers and judges. Persistent. 30-70. Even though Leonard calls him TLP, The Little Prick, he doesn’t have to be shorter or otherwise smaller than Leonard. JANE CLARK (40-70): Used to be a TV actress. Trades on her good looks. Devious. SYNOPSIS: The evidence strongly suggests that Devorah knowingly and with criminal intent aided her boyfriend Kenneth in the commission of a robbery-murder, and her abrasive (“New York Jewish”) personality will probably alienate the provincial jurors in the medium-size west coast city. Her attorney, Charlene, convinces the prosecutor, Bert, a former lover, to let Devorah plead guilty to manslaughter. Devorah resists at first, but after a hung jury, at Charlene’s urging, she relents, all the while proclaiming her innocence. CHARLENE (40-70): A cynical (they’re-all-guilty) criminal defense attorney, overworked, impatient, insensitive. DEVORAH MELVIN (40-70). Charlene’s client, accused of murder, highly intelligent, abrasive. KENNETH ALTOBELLI (40-70). Devorah’s live-in boyfriend (they were married until they divorced for tax reasons), a sociopath, mercurial.